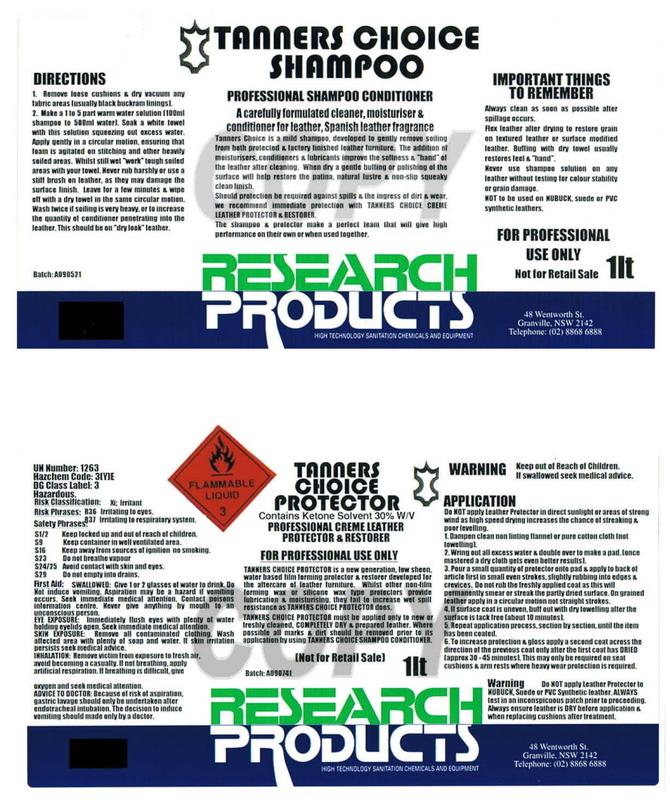 Tanners Choice Shampoo, leather cleaning and protection program, safe and simple. For professional use only, not suitable for domestic use. An Armourcoat, water-based protector for leather and vinyl. These two products provide professional upholstery cleaners, leather restorers and leather trades people with the simplest and safest method of cleaning and protection of leather furniture and leathercraft products. It is the only system that breaks away from tradition of waxes and oils which for years have provided only a minimum of protection to the leather surface. Modern leathers, using wonderful soft and light colours require a new generation of protection as well as ease of cleaning. RESEARCH PRODUCTS, as Australian commercial leaders in carpet and upholstery maintenance chemistry have devoted their R & D efforts to providing a simple two step system for cleaning and protecting leather. The first step deep cleans and conditions. The second step provides a super flexible soil resistant barrier coating that sheds dust and grime and provides an easier and safer surface to clean. Nobody has made a system simpler or more effective for modern or antique leather. The more you understand about leather, the more you know how to advise your customers on how to look after it correctly. We want you to be the adviser to your customers, so that their prized possession retains its beauty for years. Using a mild shampoo as a base, we have incorporated lubricating waxes, emollients and moisturisers that penetrate deep into the leather as it is cleaned. These ingredients ensure that the leather will not dry out or crack prematurely. The waxes deposited also may be hand buffed when dry to improve surface softness and gloss as well as provide a soft glove like feel. Directions for use are simple to follow and require no special skills. Instructions are on the label, the only thing you have to remember is that before you hand burnish or use the protector, the leather must be perfectly dry. If protection is required by the customer, hand buffing the surface is not necessary. Just wait for the surface to dry and apply TANNERS CHOICE RESTORER and PROTECTOR. This is a new generation protector for leather that forms a protective film that penetrates and bonds to the surface, creating a tough barrier layer that resists spillages, abrasives and grime. It contains no wax or silicone products as these offer poor performance against hot or oil based spills. Tanners Choice Protector and Restorer is only applied to freshly cleaned or new leather. It dries to a natural soft sheen and will only show higher sheen when more than two coats are applied. Not for use on Nubuck or suede. Do not apply Leather Protector in direct sunlight or areas of strong wind, as high speed drying increases the chance for streaking and poor levelling. Dampen clean non linting flannel or pure cotton cloth (not towelling) if weather is hot. Do not add water to Protector as this will promote streaking. When you are more experienced a dry flannel may be used. Wring out all excess water and double over to make a pad. Pour on a small quantity of Protector onto pad and apply to back of the article first, in firm even strokes, slightly rubbing into edges and crevices. Do not rub the fleshly applied coats as this will permanently smear or streak the partly dried surface. Repeat this process, section by section, until the item has been coated. To increase protection, apply a second coat across the direction for the previous coat only after the first coat has dried (approx. 30 - 45 minutes). This may only be required on seat, cushions and arm rests where heavy wear protection is required. After surface has been protected it will be safe to use once the solvent smell has dissipated (usually a few hours after treatment). These instructions are for the use of the householder after the leather has been treated with TANNERS CHOICE PRODUCTS. Wipe up spills immediately with absorbent cloth or sponge. Clean spots and stains with any proprietary woolwash diluted 1 to 10 parts water. Leather has very few natural enemies, however, the accumulation of sweat, grime or body oils on the leather will, if left untouched, cause a breakdown of the protective coating. Areas frequently in contact with perspiration and body oils will require more attention. Clean as often as necessary when perspiration and body oils come in contact with our furniture. Particular attention should be paid to the arms, headrests and cushions. These areas may require more frequent cleaning.